Cats have a unique style of fighting that can often be very funny to watch. The noises cats make combined with their calculated attacks are endlessly amusing to humans, though these cats probably don't see the humor in it themselves. 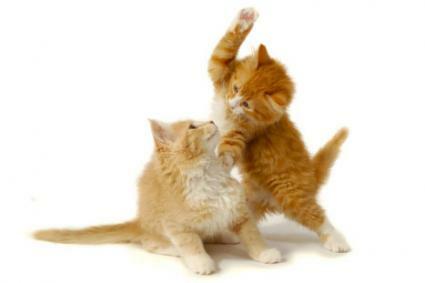 Check out some of the funniest cat fight videos. If there's one thing that most cats can agree on, it's that water is bad. That's what makes this video so amusing! You can probably guess how it ends. If you look at all the clumps of white fur on the floor, this fight was clearly going on for some time before the human of the house thought to record it. The white cat definitely has some moves though! What happens when one cat decides it's nap time while the other disagrees? Well, this actually. There's not much food left in this bowl, but neither cat is willing to let the other have the scraps. Added bonus: sound effects! Cats and mirrors can be an amusing combination. Take this cat for example, who really wants to fight with the growling kitty he's looking at, but can't quite get his attacks to land as they should. These two cats are ready to face off, when suddenly one of them pulls off a stance that temporarily stuns his opponent. Well played Sir Kitty, well played. Someone decided to have a little fun with his household felines and the resulting video is fun to watch, even if you're not a boxing fan. Kittens fighting with one another are funny enough on their own, but when another member of the family decides to break things up it gets even funnier. Watching these two cats you know that a fight is imminent. Their tails are swishing back and forth, they're staring at one another, and the tension is palpable. What you don't count on is how it ends. Cats want humans to believe that they're always in control of themselves and their surroundings, but these videos prove that this isn't always the case. They'd be mortified to know that humans were capturing their fights and sharing the videos with the world, which makes them even funnier!